Did you know that famous artists like Pablo Picasso, Andy Warhol, and Charles M. Schulz used their four-legged friends as muses for their artwork? 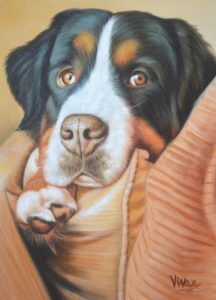 Dog portrait paintings have appeared since men learned to draw in caves to mark our bond and fondness for these animals. It is no wonder today’s pet dog owners would willingly pay someone to create a work of art featuring their beloved pets. Obviously, the very reason you have your dog’s portrait painted is to commemorate and celebrate your pet. You’d like to be reminded of your dogs, especially when they are no longer with you since they still hold a special place in your life. Harvard art history professor Joseph Koerner told Bloomberg that portrait painting denoted fame and the afterlife in the old days. It was the rich and highborn that commissioned paintings of themselves, sometimes with their pets, to capture their essence long after they’re gone. So, it makes sense for pet owners today to want to stick to this medium despite the presence of digital photography and selfies. 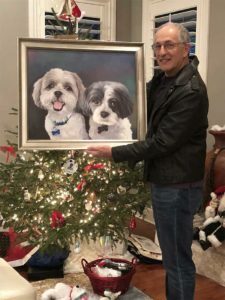 In fact, the same Bloomberg report cited that pet portraiture is still lucrative for artists who specialize in pet portraits because of the perception that digital photographs are “instant” while paintings last a lifetime. 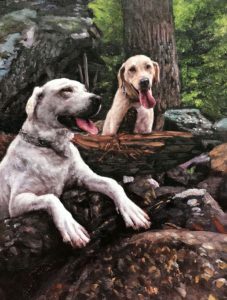 Dogs, however, cannot sit for portrait sessions too long so what the artists do is work with photographs of the dog to capture their element in their natural environment. There’s a great video from PaintYourLife that shows exactly how this works. 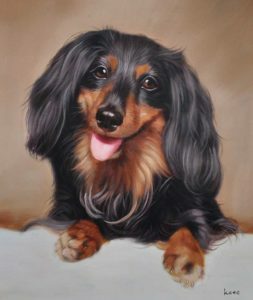 Dog portrait paintings can be much more informal, fun and contemporary depending on the artist you hire to do the work. Sometimes, the artist will even add elements based on what he or she interprets and sees from the dog’s personality. It is this element that makes dog portraits a lot more valuable. With pet portraits, the artist takes time to sketch the image and apply the brush strokes. And while digital photographs can be manipulated to look like a painting as well, it is the artist’s process and the detail that goes into a handmade portrait is what people pay for when commissioning their work. Scholars have studied some of the most famous paintings in the world not only to get insights into the personality and psychology of the subject and the artist, but also because these works of art generated public interest. One famous dog painting that has been the subject of debates and discussion is Cassius Marcellus Coolidge’s “Dogs Playing Poker” series. Many American working class families had Coolidge’s pieces on display in their homes in the ’60s and ’70s because the images were relatable and people loved to talk about it. Your dog’s portrait painting may not generate the same level of interest as Coolidge’s work, but for your family and friends, the dog’s painting would draw a lot of curiosity and attention. Imagine your guests marveling at your dog’s portrait when they visit your house. Who doesn’t enjoy talking about how the work of art came to be, especially when the point of inspiration is your pooch? Portraits are created not just to memorialize its subjects but to also tell a story. If you hire a good artist, you can expect to get a great story from his or her work on your dog’s image. A good artist can make their subjects larger than life. You can help the artist by taking specific themed photos of your dog to better illustrate your pup’s personality, like photos with his favorite toys, or in his favorite dog crate, or positioned in your pet’s favorite sleeping spot. All of that enhances the theme of your pup’s portrait. From the artist’s perspective, creating pet portraits with stories involve finding the right shapes, textures, angles, composition, and color. It’s also about positioning the subject either as isolated or integrated with the background, so the location of the portrait is an important part of the artist’s creative process. Understand that artists need to take time to create the masterpiece. So, if you’re asking an artist to paint your dog’s portrait, anticipate that it will take a while to finish and might cost you more than a digital photograph (but is totally worth it). If you’re a socio-activist who is against animal cruelty and support shelter animals, you might want to have your dog’s portrait painted to help a cause. Artists and animal lovers Suzanne Donaldson and Shayan Asgharnia did just that and teamed up with the pet rescue organization Social Tees Animal Rescue (STAR) to work on 19 portraits of shelter dogs from high-kill sites in the United States. The project inspired other people to adopt and save these abandoned pets. You can take points from what Suzanne and Shayan mounted in order to raise awareness on dogs at animal shelters. There might be plenty of artists and pet owners in your community who’ll be willing to join your cause. Some artists even donate part of the proceeds they earn to animal shelters. If you don’t plan on mounting an event, you can still help change the public’s perception of shelter animals with your pet’s portraits. When you put this on display at your place of work, for example, then you open the opportunity to talk about your cause to your co-workers and tell your dog rescue story to inspire others. The Internet is a rich resource for finding artists who can work on your dog’s portrait painting. Many of these creative people have profiles on sites like Etsy or Instagram. Or, you can simply Google for the artists by typing “pet artist + your city + your state” on the search bar. Artists usually have their own websites and online portfolio. Google will also provide the map to their studio if there’s a location noted on their sites. 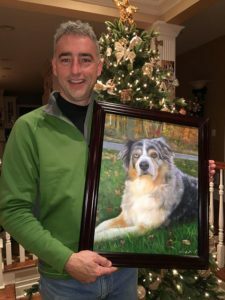 If you’re looking for a quick and convenient way to get a quality dog portrait done, I would personally recommend a service like PaintYourLife as I’ve had amazing experience with them. Alternatively, you can ask family members, friends and work colleagues if they know an artist willing to do portraits, or if they’ve tried out someone’s services. Their referral or recommendation might be even better because you actually can get a first-hand feedback of the artist’s work. Artists work in different mediums, such as acrylic paint, oil pastels, charcoal, or watercolors. Some work on the unusual canvas like wood, metal or glass. Artists also have different styles and creative outputs. Some might do traditional paintings, while others may be best at doing illustrations and comic portraits. Carefully go over the artist’s work samples before deciding to contact them. Be sure to read the details of the service they render and the process to follow before hiring the artist for the work.